As you can see the gelled soap turned brown with small speckles and the non gelled soap stayed nice and white with I would say the same amount of speckles as the gelled soap. 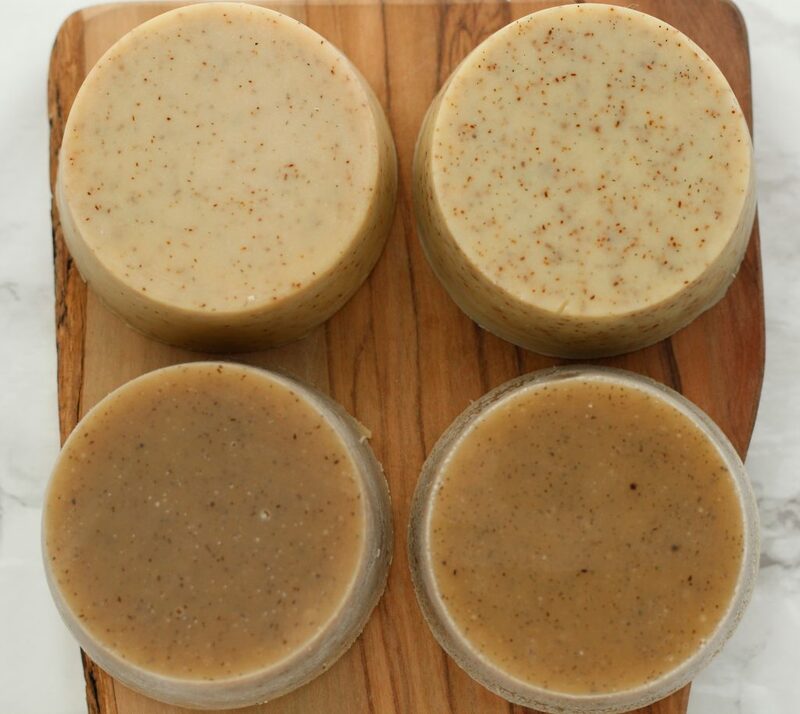 The gelled soap – no surprise here – turned brown, but with more speckles. The non gelled soap has a lot more tiny specks as well with colors ranging from brown to almost orange. The pictures you see in this post were taken after a 2 week cure. I didn’t notice the speckles becoming over time, and if anything they became more especially with the ripe banana. But I will keep an eye out for any changes and as always I will update this post in 6 months with a follow up picture. 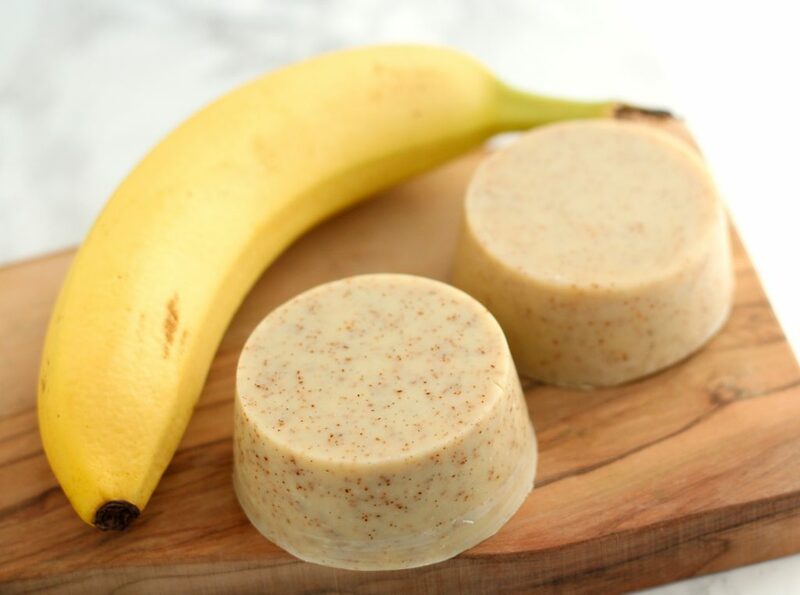 I made this recipe twice using the same amount of banana puree for both batches. The only difference was the ripeness of the banana. This recipe is superfatted at 5% and uses a lye concentration of 40% (which is steep, but accounts for the added liquid coming from the banana). 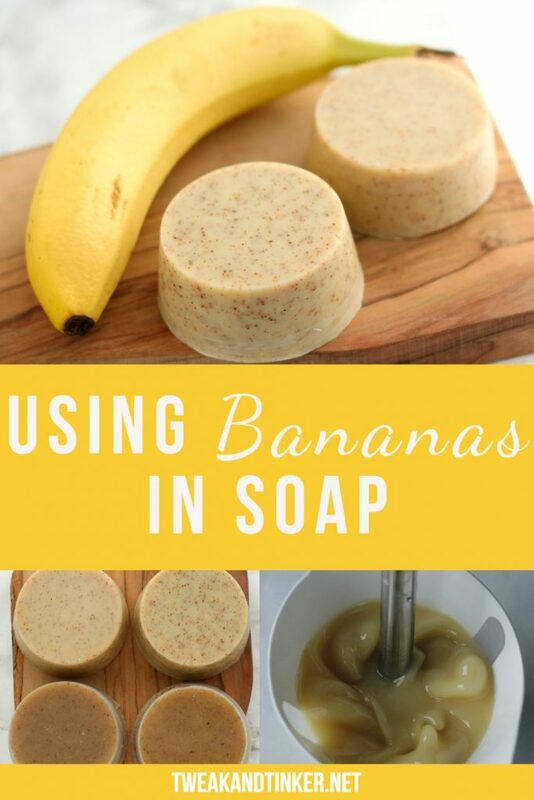 Have you tried using bananas in soap before? How did it turn out? If the soap was brittle, I would let it rest at room temperature for another day, before trying again. Hi Celine! I tried to make a rose banana soap today. I did it before reading this. I’m still learning, it’s been just four months since I started making soaps. I really wanted to use bananas and roses together since is a very special combination that reminds me of my mom. As soon I mixed the rose water (made by myself) the lye turned it green and few seconds after turned orange and the smell was strange but then I mixed it and put the smashed banana inside and it saved the smell A LOT! it turned put completely brown like dark brown and it’s really soft. I will make it again with your suggestions. Thanks a lot for this article and I’m going to follow you.